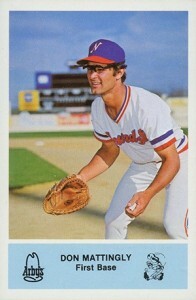 1980s minor league baseball cards are some of the hobby's most overlooked gems. They have a core collector base that's dedicated and prices can reach amazing highs. But, for the most part, they're largely ignored by a huge part of the hobby. Today, most 1980s baseball cards are worth very little, if that. Minor league cards are a huge exception. Often issued by the teams themselves in the form of team sets, print runs are generally much smaller. By their very nature, they were regional as well. Collectors had to rely on mail order deals to track down their players and teams. With such modest prices on a lot of rookie cards for players debuting in the late 1980s and early 1990s, minor league cards are a nice alternative for collectors who prefer high-end cards and more of a challenge. Many of the top minor league cards from the 1980s can sell for four figures if they're in top condition and authenticated by a reputable grading company like PSA or BGS. This is especially important to protect yourself against counterfeit cards and reprints. Most sets used very basic printing techniques, making fakes very easy to produce. For cheaper cards, this might not be a worry. But when you're shelling out hundreds, if not thousands, of dollars, the added piece of mind should be a considered. Below is a look at 20 of the most iconic minor league baseball cards of the 1980s. Click on the card images or names to shop for singles on eBay. 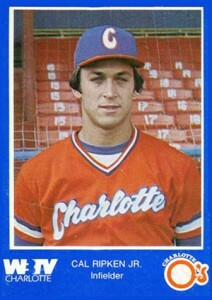 1980 Charlotte O's Cal Ripken Jr. Considered to be the top minor league baseball cards of the 1980s, there are two versions of the 1980 Charlotte O's Cal Ripken. The orange version, known as the 1980 Charlotte O's Police set, was handed out by local officers. 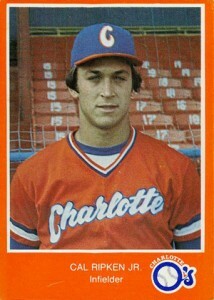 The blue 1980 Charlotte O's WBTV card is part of a team set given out at the ballpark. Although the cards use the same Cal Ripken photo and much the same design elements on the front, their backs are different. The WBTV card has an error on the back with Ripken's name being spelled "Ripkin." It's strange seeing a young Ryne Sandberg in a Phillies uniform. 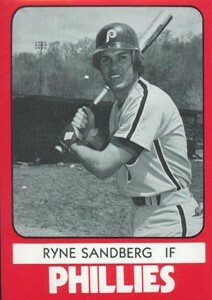 Pre-dating his first MLB cards by three years, the 1980TCMA Reading Phillies Ryne Sandberg is extremely tough to find in high-grade. As a result, prices can go very high, even for copies that have noticeable flaws. The photo on the first Don Mattingly baseball card looks like it's a relic from a 1960's time capsule. The team-issued card was sponsored by Arby's. The Sounds later reprinted the set, which has kept prices a lot lower than they might have otherwise been. 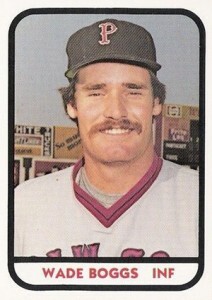 The first Wade Boggs card looks as though it might be part of a Donruss set from roughly the same time frame. The design is simple but it works. Another monster on the minor league card circuit, this might not be Cal Ripken's first card but it's still extremely popular with professionally graded near-mint copies hitting three figures. 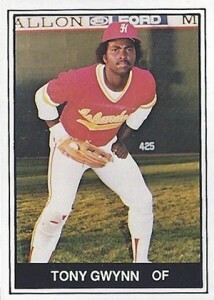 Like most 1980s minor league baseball cards, the 1982 TCMA Tony Gwynn features a simple design. Shown as a member of the Hawaii Islanders, the card came out a year before his official rookie cards. What do we have here? It's one of the most popular quarterbacks of all-time proving his two-sport prowess. 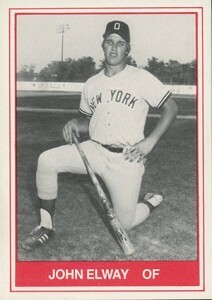 Picked by the Yankees in the 1981 MLB Draft, Elway obviously elected to go with football. However, hopes were high in baseball circles for the Stanford standout. 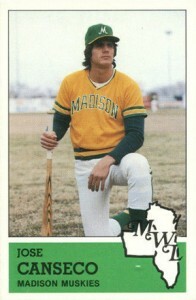 Like most every Jose Canseco card from the 1980s, his 1983 Fritsch Madison Muskies card may not have the same prestige as it once did. Still, a lot of collectors have a soft spot for the slugger. This is his first baseball card. Like the 1983 Madison Muskies Jose Canseco, Kirby Puckett's first cardboard appearance came courtesy of Larry Fritsch, one of the hobby's early mail order leaders. 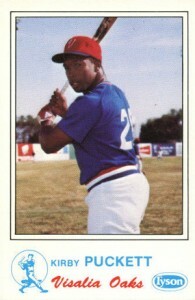 It's not very colorful, but it's still one of the top Kirby Puckett cards ever produced. The green doesn't exactly go with the reds and blues most are used to with Roger Clemens cards. However, the green borders make for a tough card to find in top condition. Expect to pay several hundred dollars if you want a professioanlly graded copy that's mint. 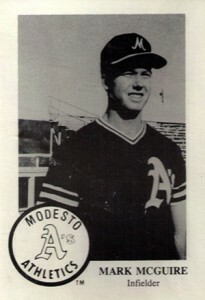 The 1985 Chong Moesto A's Mark McGuire isn't the most attractive card, and that's not just the glaring spelling error found on the front of the card. A corrected version is also available, although it's not nearly as valuable. 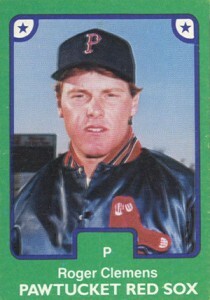 Reprinting and McGwire's fall from grace keep this card out of the decade's top tier of minor league cards. Atlanta Braves fans have lots to go after from 1986 ProCards minor league sets. 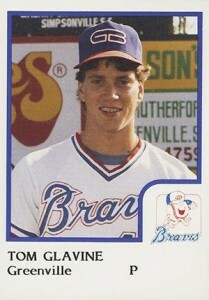 Kicking things off is the first Tom Glavine card. Pictured as a member of the Greenville Braves, it's also available as part of an uncut sheet that was likely part of a stadium giveaway. The sheet has logos for Hardee's and a local radio station. 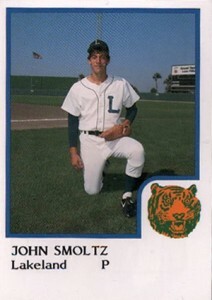 Another pitcher who rose to prominence with the Braves, this is one of the few pieces of hobby lore to show John Smoltz with the Tigers franchise. 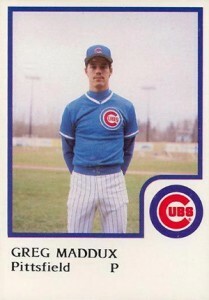 The last of Atlanta's "big three" pitchers that dominated the National League a decade later, the first Greg Maddux card is a very plain affair. Still, as one of the greatest of his generation, it's a must-have for big-time Maddux collectors. Professionally graded Mint copies top the $300 mark. 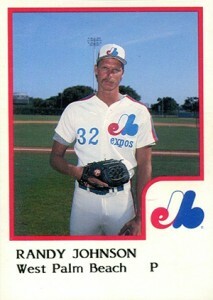 Randy Johnson doesn't look very happy on his first card. Or is there a too-cool-for-school smirk hiding under that mustache. Either way, look for this card to get more attention once Cooperstown makes a call and collectors are reminded of just how dominant this gentle giant was. 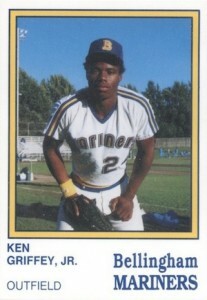 The 1987 Bellingham Mariners Ken Griffey Jr. has the distinction of being the mega-popular outfielder's first card. That alone makes it an immensely popular card. 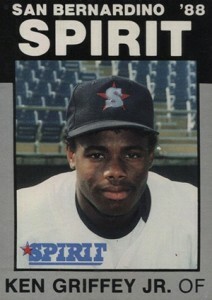 Griffey has several other minor league cards that came out prior to his MLB debut. 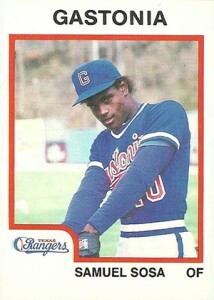 Another card showing a player with a franchise other than the one he rose to prominence with, the 1987 ProCards Sammy Sosa was about three-years old before his first rookie cards came out. A very plain card, it's reasonably priced today. The team set also includes another notable slugger, Juan Gonzalez. 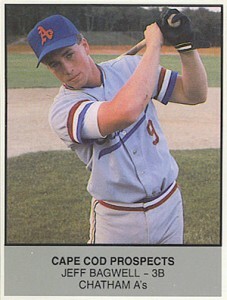 The 1988 Ballpark Cape Cod Prospects Jeff Bagwell is somewhat overlooked among 1980s minor league cards. Should the first baseman get elected to the Hall of Fame, expect the overlooked status to disappear. Although pricier than his 1991 rookie cards, it's still very affordable. While it's not his first card, the 1988 Best Platinum Ken Griffey Jr. consistently reaches higher prices. There's also a more common version that has blue borders. It's believed that 1,300 copies of the Platinum version were made, a miniscule number given print runs for major league sets at the time. 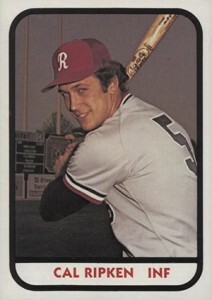 One of the more attractive minor league cards from the 1980s, the black borders put a premium on high-grade copies. With Biggio's Hall of Fame standing up for debate, there's some room for this card to get some added attention. 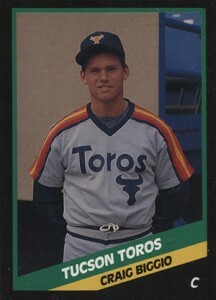 Biggio also has a 1988 ProCards minor league card as well that is more common. I need answers. Lol. I have two 1979 Ogden A’s Rickey Henderson cards. However on the back side one has a crooked “e” in Rickeys first name. I havent been able to find any info on this card. Multiple print runs? Fake? Any help would be gratly appreciated. The one I have with the straight print “e” is graded but its by a company called Rare grading,inc.